Kelli Anderson, the illustrator and designer we worked with to create The Human Body makes magical things out of paper. We thought we should share this one with all of you. Kelli also created an amazing little stop-motion video of all the systems in the body. Long lines of nerves and veins, every little bone, and winding bands of guts are all cut out of paper. All the sounds that accompany the video are also made of paper. Watch that video here. If your kids are enjoying The Human Body and you would like to help us, please leave feedback on the iTunes store. It makes a big difference. 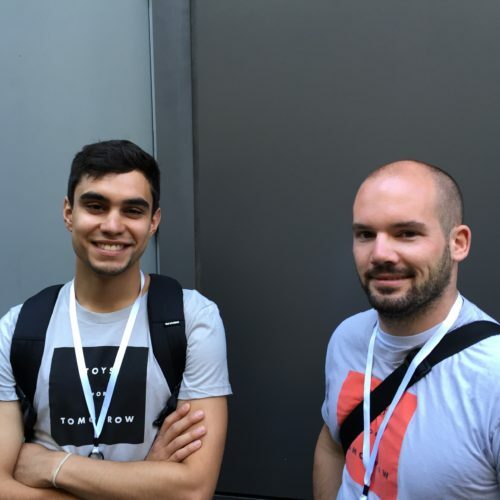 This year some of the dev team at Tinybop — Rob (not pictured above), Cameron, and I — got the chance to go to Apple’s Worldwide Developers Conference (WWDC) in San Francisco. It was nice to be surrounded by knowledgeable developers with an eagerness to both learn and share their experiences.